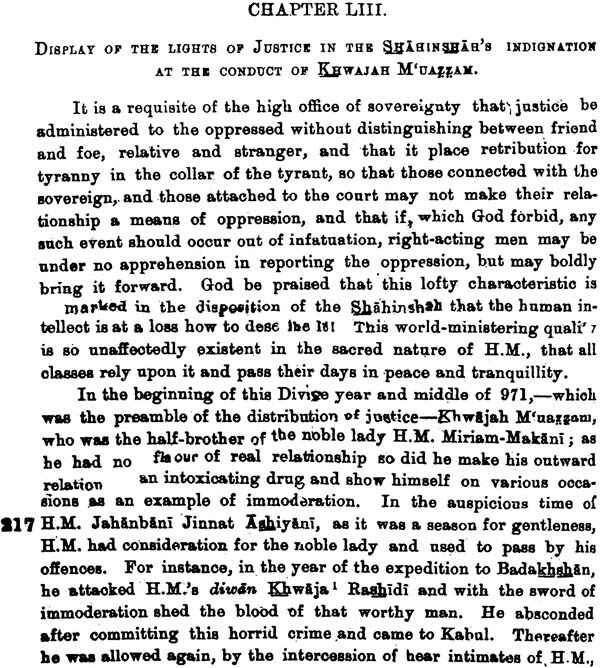 The late Henry Beveridge, ICS took over two decades for the completion of the final volume of English translation of Akbar Nama On being assigned the task by the Asiatic Society of Bengal in the year 1897 he started his work. He. 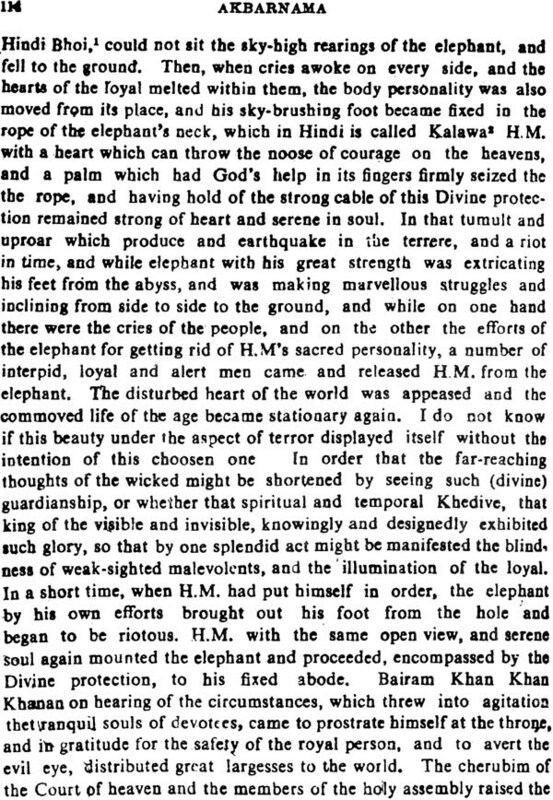 however, expressed his desire not to do the complete translation but suggested that he should take up editing the manuscript version by Leutenant Chalmers which was duly accepted by the authorities of the then Asiatic Society of Bengal. 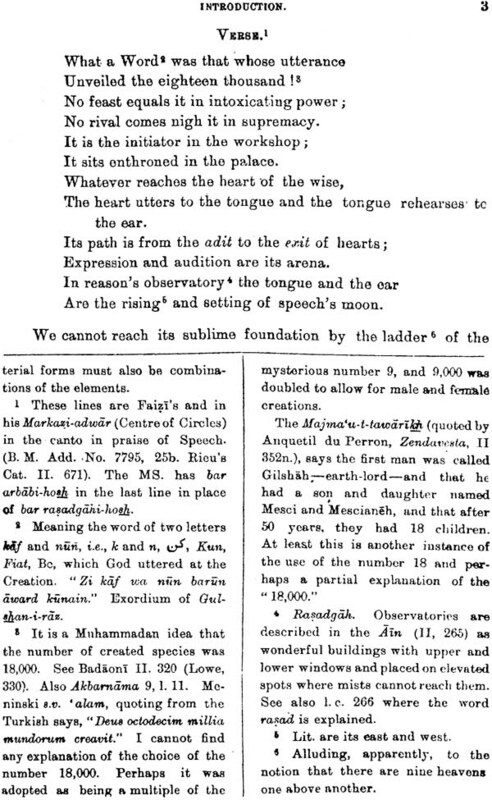 After he started the work in 1897 the translations were trickling out in prints in fascicles. The first eight fascicles were published in 1907 as the first volume. The second volume with seven fascicles and the third one with fourteen fascicles along with index came out in succession. Beveridge ultimately completed his translation in 1921. It took some more time for correction, revision, preparation of List of Contents, Abbreviations and Additional Errata and Addenda to the index. But thereafter the publication was delayed for several reasons. It was, however, the initiative of Dr Baini Prashad to complete the work and to publish the volume finally in 1939. 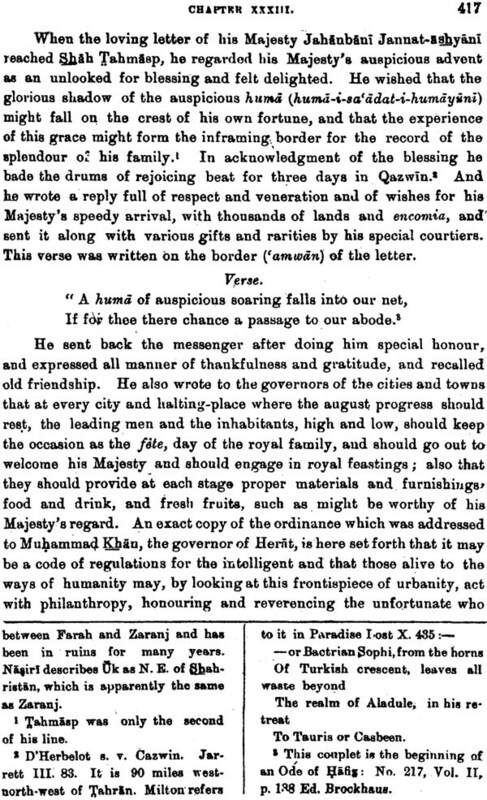 It is almost after a gap of 60 years, the Society has again taken initiative in bringing out Beveridge’s translation of Akbar Nama in a consolidated and comprehensive manner. 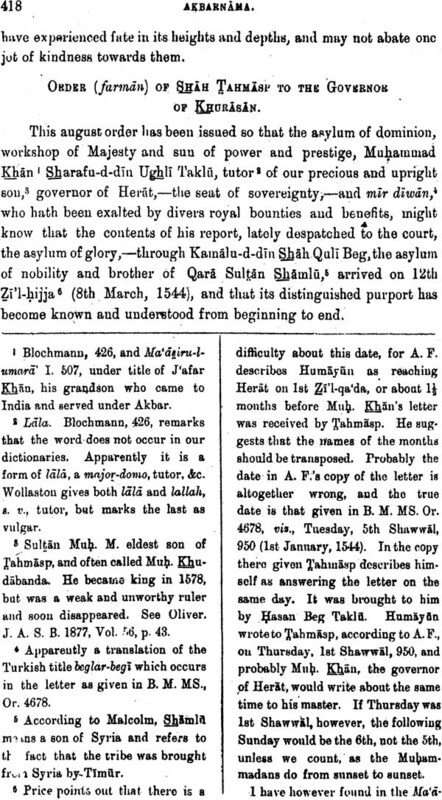 This is a much sought after publication since Allamah Abul Fazl`s Akbar Nama always retains its fascination for its minute account of the customs and traditions of the people of India during the reign of Akbar, the ablest of the Mughal emperors, who has been so much extolled by historians for his sagacious statemanship, dexterous diplomacy and military skill. 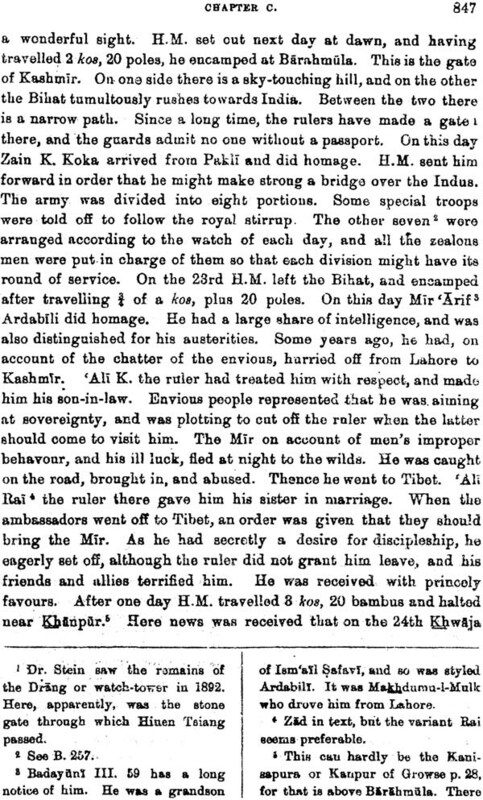 The historical importance of this publication is further enhanced by the fact that its author was Akbar’s intimate friend and confidential adviser and, therefore, had access to first hand information. The present three volumes are the reprints of our earlier publication under Bibliotheca Indica Series. It covers the period from 1542 to 1605 AD. The introduction, various explanatory notes etc. from Beveridge and the Index have also been retained in their original style. I hope that the scholarly world will find the reprinted volumes helpful, handy and worthy of preservation. 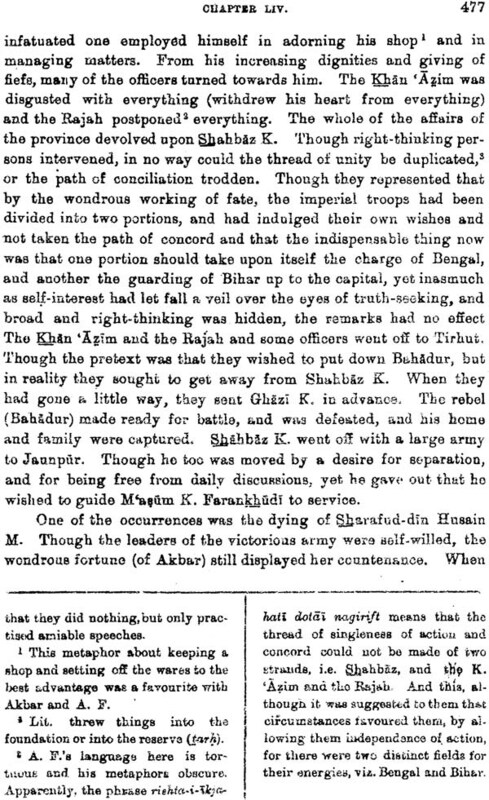 When the Asiatic Society of Bengal did me the honour of inviting me to translate the Akbarnama, I replied that I doubted my ability to make a complete translation, and suggested that I might edit the manuscript version by Lieutenant Chalmers. 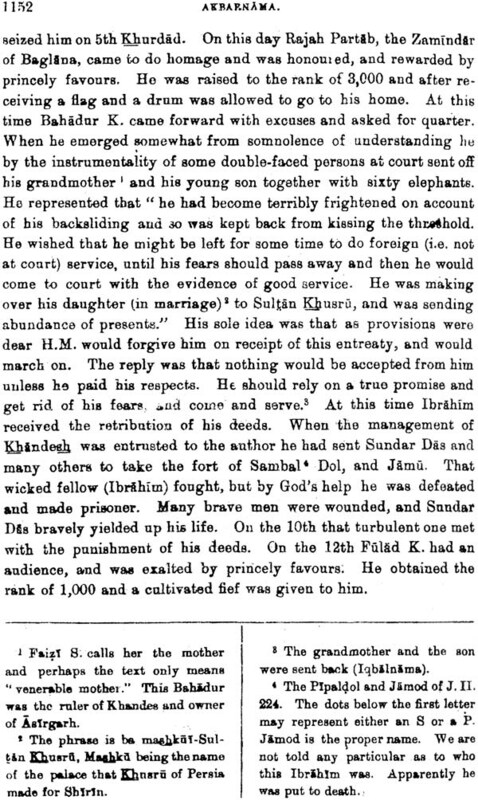 My suggestion was accepted, and I accordingly obtained from the Royal Asiatic Society the loan of the Chalmers' manuscript and permission to print it. I soon found, however, that the translation was too abridged to be made the basis of my work, and that it was necessary to execute a new version. 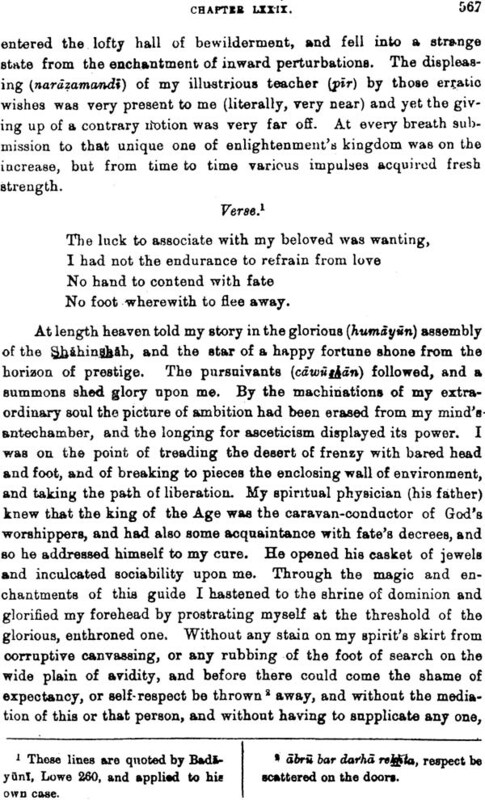 Chalmers’ manuscript was of great service to Elphinstone and Count Noer, and it has also been of much use to myself, but there are many gaps in it, and Abul Fazl’s language has throughout been greatly compressed. 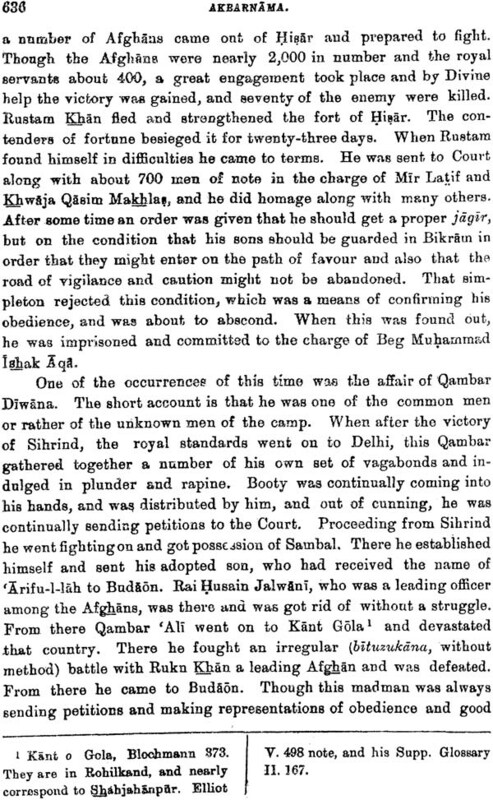 One gap Bear-the beginning extends to over ninety pages of the printed text, and has the effect of omitting the account of Akbar’s birth, with the prognostics and horoscopes appertaining thereto, as well as the notices of his ancestors from Adam down to his grandfather (Babar). The reader may judge of the extent to which abbreviation has been carried, when I state that the Chalmers MS. consists of two thinnish volumes of foolscap, and that the Bibliotheca Indica edition of the Persian text, occupies three large quartoee which aggregate 1,600 pages. The task of translation has occupied me several years, and the work has not been very congenial, for Abul Fazl is not an author for whom one can feel much sympathy or admiration. He was a great flatterer and unhesitatingly suppressed or distorted facts. His style too, seems—at least to "Western eyes—to be quite detestable, being full of circumlocutions, and both turgid and obscure. He is often prolix, and often unduly concise and darkly allusive. His one merit—and it is one which he specially claims for himself—is his laboriousness. 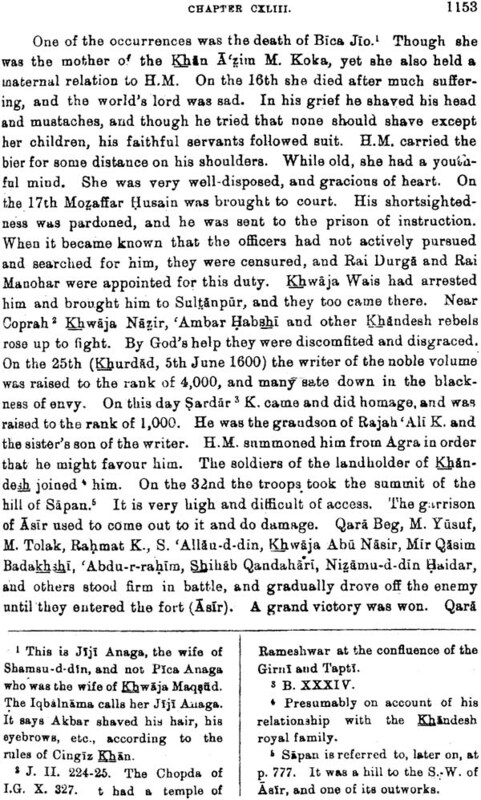 He was an unwearied worker, and when we blame him and lament his deficiencies we shall do well to consider what a blank our knowledge of Akbar’s reign would have been, had not Abul Fazl exerted himself during years of strenuous effort to chronicle events and institutions. His work also has the imperishable merit of being a record by a contemporary, and by one who had access to information at first hand. 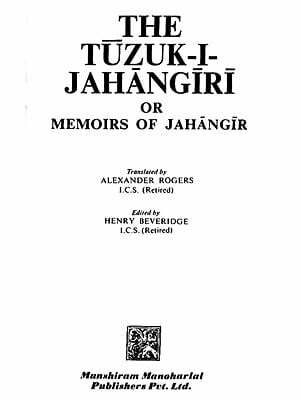 I regret that the work of translation has not devolved upon a better Persian scholar than I am. I have endeavoured to do my best, and I have sought assistance in many quarters. I now desire to express my gratitude to my friends, Maulvi Abdul Haq Abid, the late Mr. 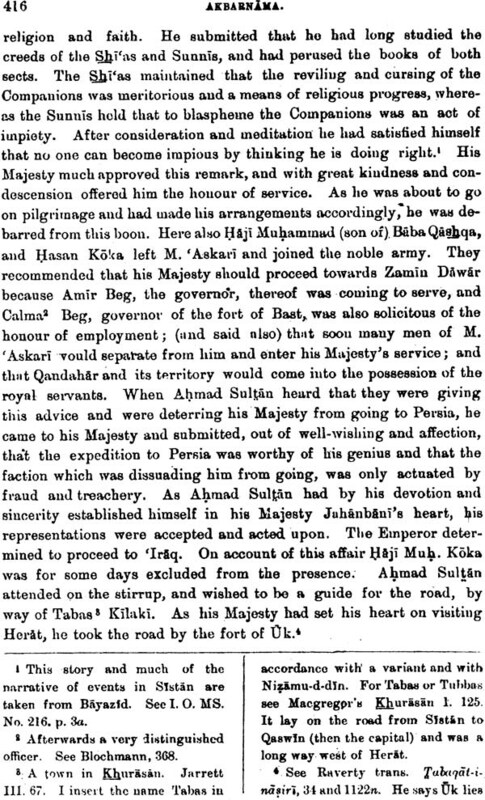 I. Beames, Mr. A. G, Ellis of the British Museum, Mr. Irvine and Mr. Whinfield, and to the translation of the Ain—i— Akbari, by Professor Blochmann and Colonel Jarrett, and the works of Major Price. I am also indebted for much literary assistance to my elder brother, Mr. David Beveridge. There are, I am sure, many mistakes in my translation and notes, but there would have been many more but for the assistance of my friends. I regret that I have been obliged to make two long lists of Errata and Addenda. In part this has been due to the translations being made in England and printed in India, and in part to increase of knowledge. The translation of the second volume, which carries on the history of Akbar’s reign to the middle of the seventeenth year, has been completed by me, and I am about to begin the translation of the third and last volume. The translation has been made from the Bibliotheca Indica edition of the text, but I have consulted many MSS. in the British Museum, the India Office, and the Royal Asiatic Society’s Library, etc. The Bibliotheca Indica edition is by no means so good as it might have been, for the learned native editors* were destitute of geographical or historical knowledge. Hence they have often made mistakes in the names of persons and places. They have also no explanatory notes. In their preface they are severe upon the Lucknow edition. 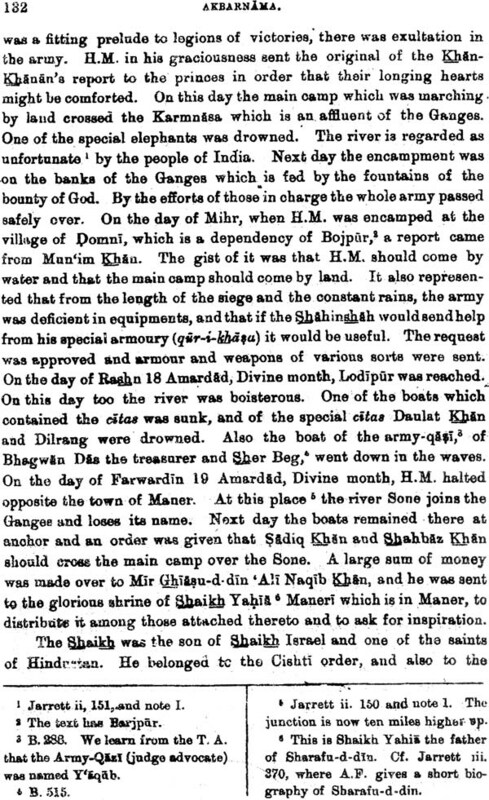 No doubt that edition has many faults, but it was the first in the field, and it is on the whole a creditable monument of the enterprise of the publisher, Munshi Newal Kishor, and of the liberality of the Maharajah of Patiala. The editor, Maulvi Sadiq Ali, also deserves honourable mention. He has added numerous notes, and though many of these are trivial, yet there are also many which are really enlightening. 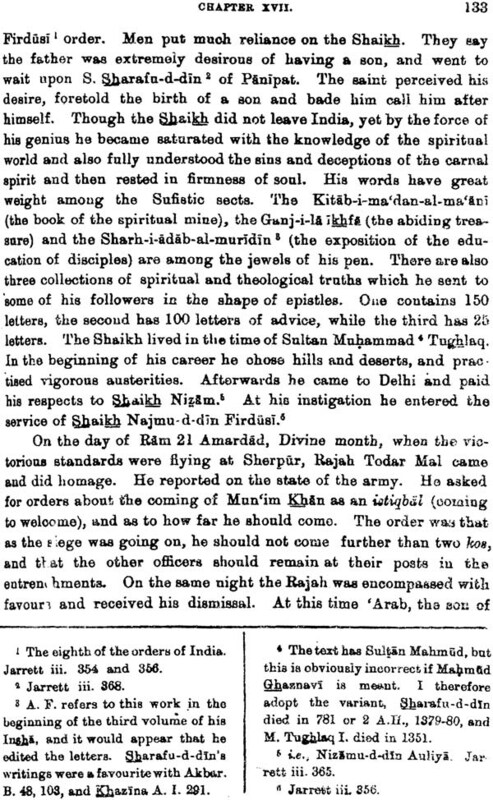 Since completing the translation, I have seen a remarkable MS. of the first volume of the Akbarnama in the possession of Saiyid Ali Bilgrami, This is evidently a rough draft and contains several things which do not occur in the MSS. of the finished work. Among them are one “or two letters of Humayun. 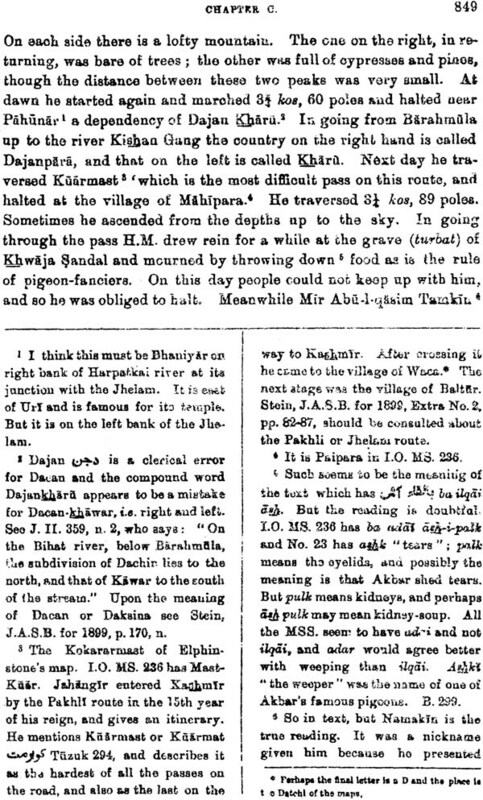 I have given an account of this MS. in R.A.S.J. 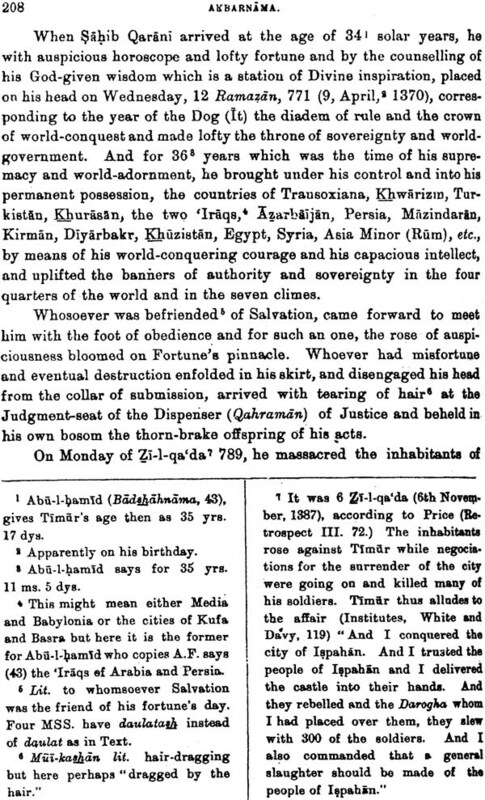 for January 1903, p.115. The completion of the final volume of the English translation of Akbarnama by the late Henry Beveridge, I.C.S, has taken a long time. Mr. Beveridge completed the translation, and the last fascicle was issued in 1921. He also prepared the Index and passed Introduction, Errata and Addenda to the volume and a Prefatory Note were completed before the death of the author in 1929. What was left to be accomplished was the correction, revision and printing of pp. 33-66 of the Index and other preliminary matters including the preparation of Lists of Contents, Abbreviations and additional Errata and Addenda to pp. 1-22 of the Index. Unfortunately this was not done due to a variety of causes, the most serious of which was a period of quiescence which occurred in the activities of the Society during this time. Thanks, however, to the initiative of Dr. Baini Prashad the incomplete portion of the work was taken up this year and the volume has now been completed. The work of Mr. D.K. Das, the press clerk, who laboured very hard to see it through the press, deserves special mention. 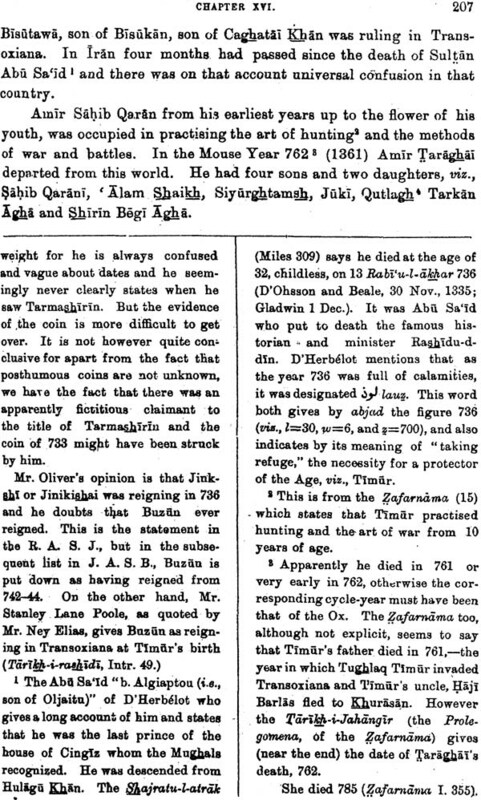 It is hoped that the reading public, while forgiving the delay of this publication, will appreciate the great erudition and care bestowed on it by Mr. Beveridge. 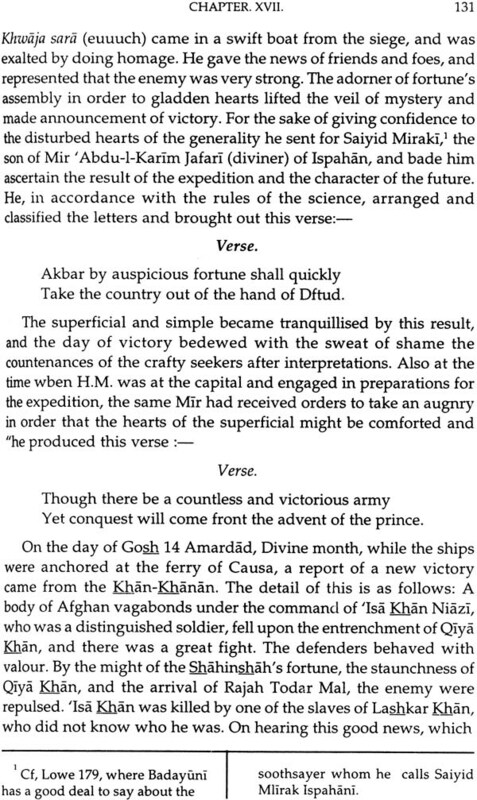 I have at last finished the translation of the historical part of the Akbarnama. It has occupied me, with occasional in- terruptions, for over twenty years, and I must confess that the work has not been always congenial. In fact, I must say that I began it with a feeling of aversion. I had the idea that Abu-I- Fazl was a rhetorician and a shameless flatterer. And I admit that the feeling still remains. I must also say that his style, especially in the later volumes, is tortuous and obscure. 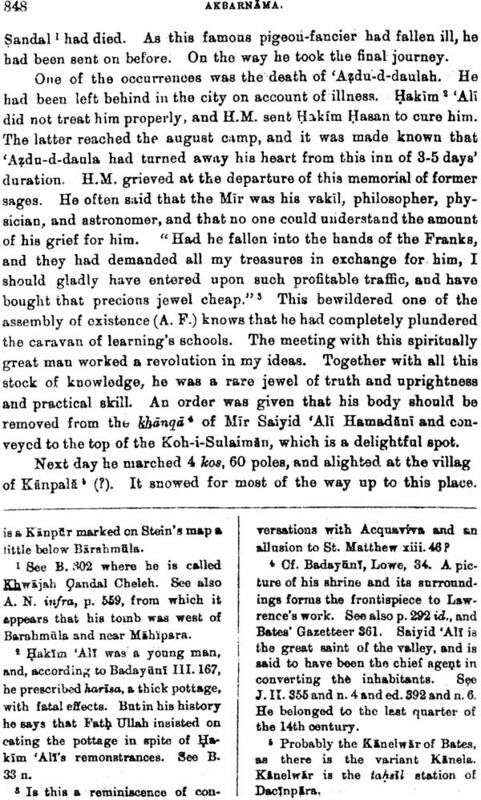 Possibly, this is due to the loss, during the progress of the work, of Faiz, his elder brother, who was a poet and who revised part of the book, and who, presumably, improved Abu-l-Fazl’s style. Left to himself, he may have adopted s. still more stilted and archaic style which, perhaps, he picked up from ‘Abdullah Wassaf and others, with the result that he became even more obscure than he was originally. But I must go on to say that his indomitable industry and his accuracy wherever he was not, from prudential motives, suppressing the truth, have at length overcome me and 1 save him with greater feelings of respect than I began with. After all, when everything has been said that can be said against Abu-1-Fazl, should we not be grateful to him for his book? If he had not given so many years of nights and days to his task, where would we have looked for knowledge of many important facts of Indian history? 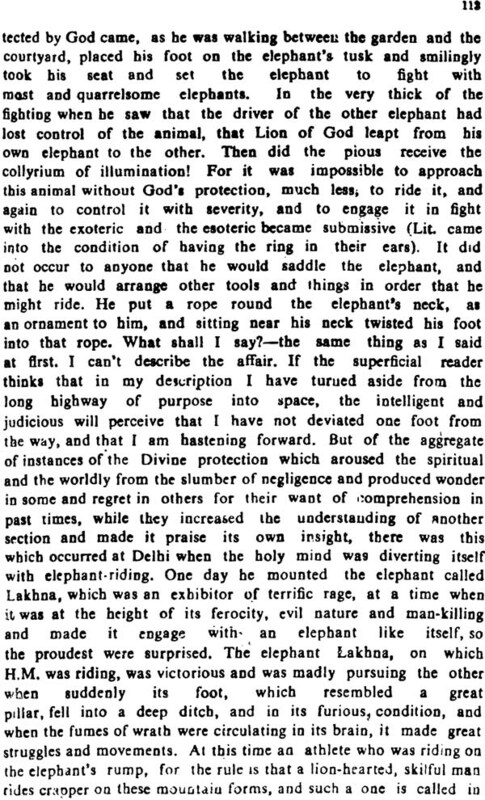 And what a pity it is that Jehangir, Akbar’s unworthy son, should have murdered the author, when he was approaching the end of his task and when there were not wanting signs that he was beginning to see that there were spots on his sun and that his idol had not worked out the beast! I believe that I am indebted to my learned friend Dr. Hoernle, C.I.E., for having led me to undertake the translation of the Akbarnama. 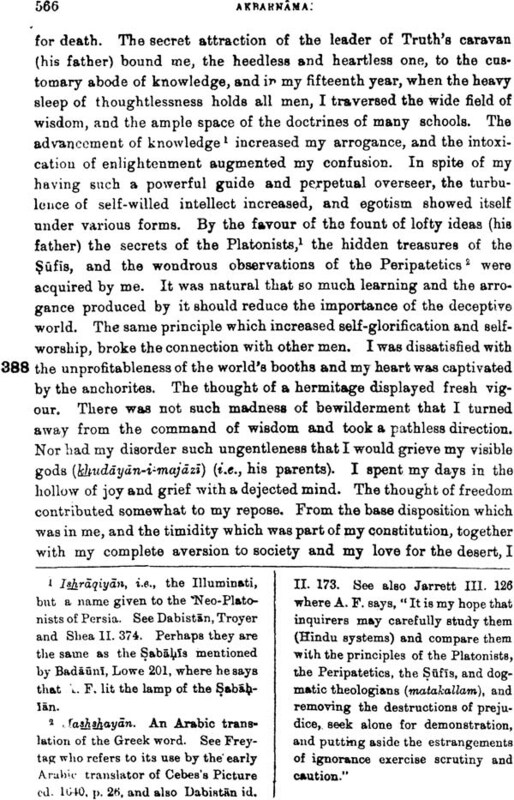 He it was who, as Philological Secretary of the Asiatic Society of Bengal, set me on a task for which I, a poor opsimath, was very imperfectly fitted. I hope I have improved as I went on, but the want of early training in scholarship can never be made good. Since I finished the translation, I have been engaged in making the Index. 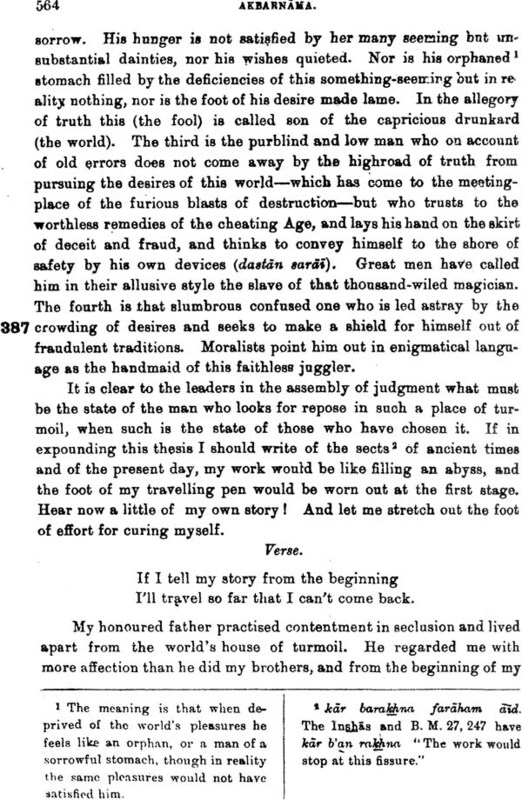 Not that I have any skill in such work, but I have thought that if I ‘did not do it, no one else was likely to undertake it, and that my translation, to use the expression quoted by Mr. Norton, the Indian Barrister, might remain a costly tool without a handle. So, I have begun it and have nearly got to the end of the letter M which is by far the biggest letter in an index to a Muhammadan work. I have also made a list of Errata and Addenda. I am sorry that they are so many and so important, but it is satisfactory that I have found them and acknowledged them. I do not think that it would repay any one to read through my translation of the Akbarnama, and I very much doubt if any one will do so. I think the world. is too busy for this. What I would recommend is that somebody should abridge the book. 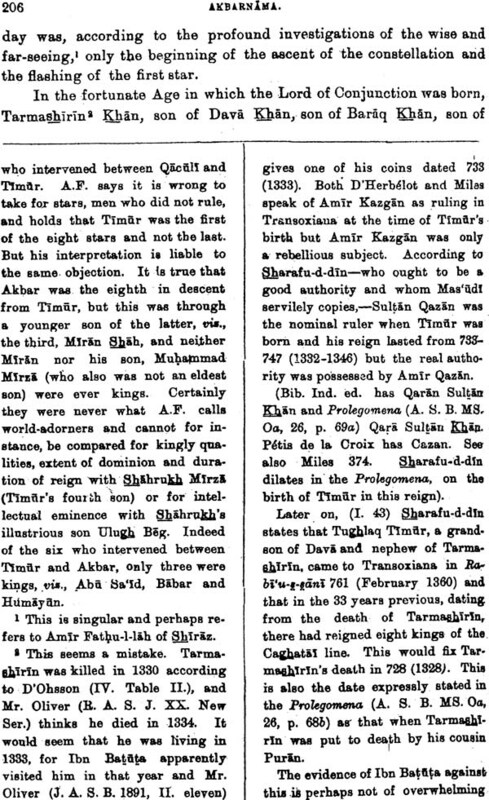 He, or she, might profitably omit the horoscopes and the biographies of Akbar’s real or imaginary pre- decessors and ancestors before Babur. 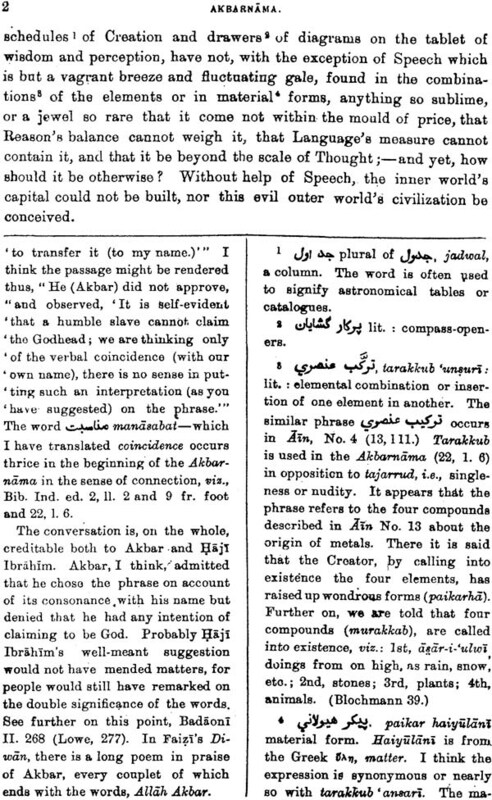 He might also omit the strings of names, the discussion about comets and a digression, in the third volume, into Persian History. He might also cur- tail occasional verbiage. 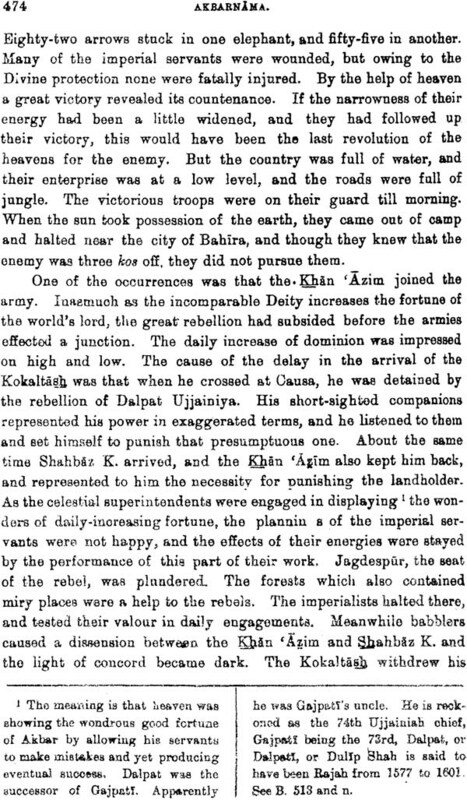 On the other hand, he might, I think, add "The Sayings of Akbar” in Colonel Jarrett’s translation, with perhaps some additions and corrections, and Abu-l-Faz1’s account of his early struggles. 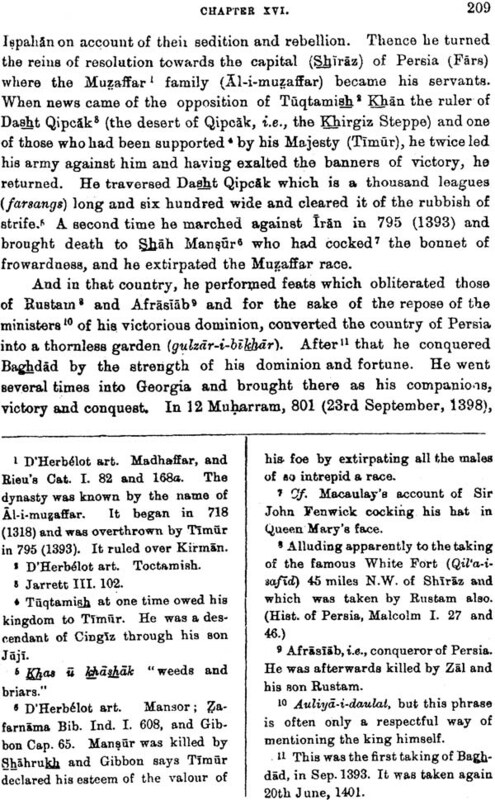 He might also add, in the original Latin, Monserrate’s description of Akbar’s person, pp. 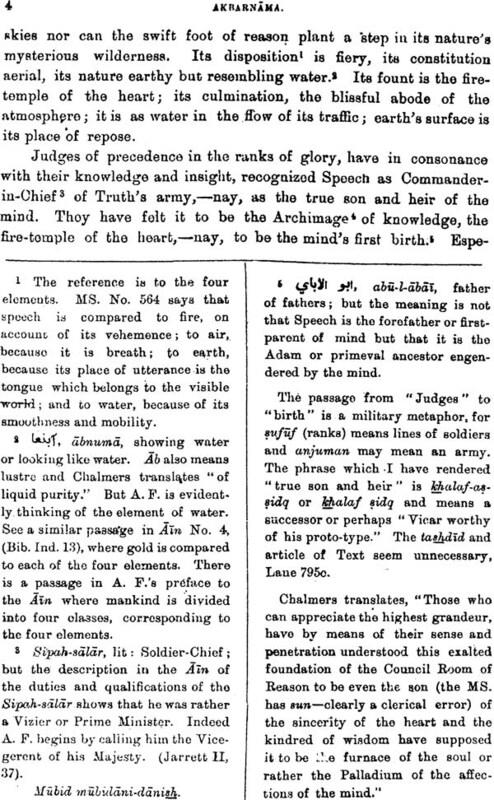 640-41 of his Commentary, A.S.B. edition. I am too old and feeble for such work and shall only say "Exoriare aliquis nostris e vocibus auctor." Abu-l-Fazl is not at picturesque writer, nor are his reflections profound or affecting. Very seldom does he make an interesting remark. He has not the charm of Herodotus, nor the outspokenness and raciness_ of the crabbed, bigoted and sinful Badauni. He seldom tells a story with out spoiling it. 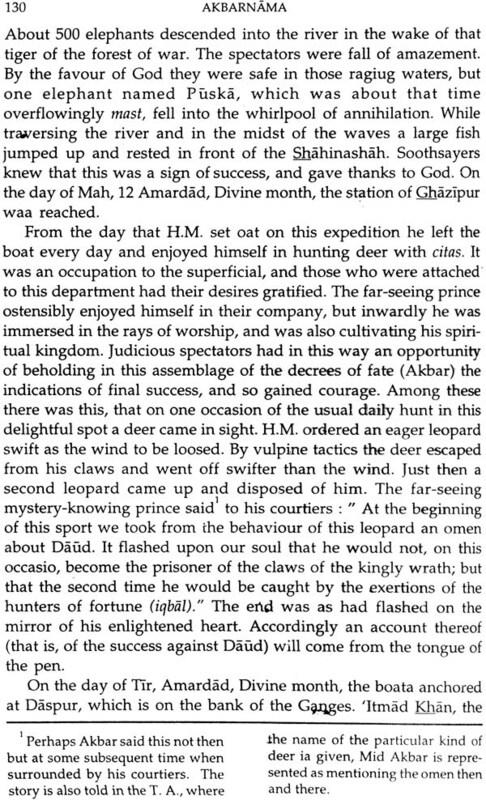 I see, for instance, the account of Akbar’s chivalrous rescue of the Jodhpur Rajah’s daughter from a compulsory Sati. 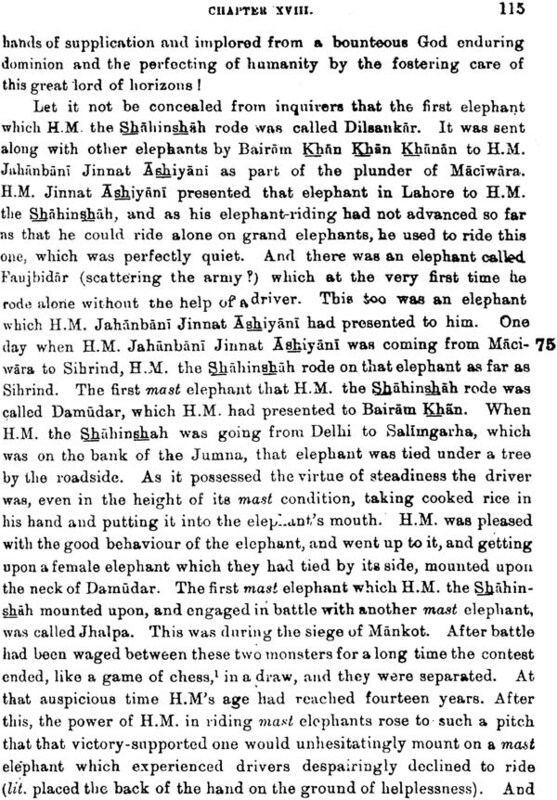 We are not told her name, nor the length of Akbar’s ride, nor any other of the little details which would have enhanced the interest of the narrative. 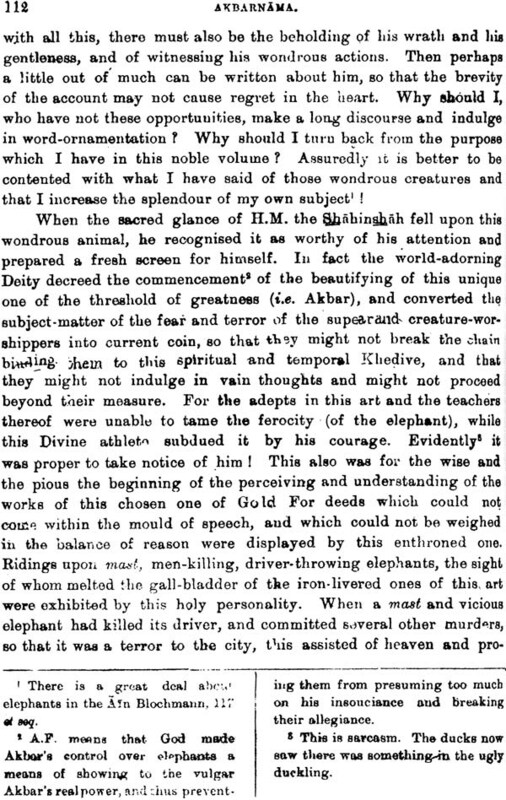 Perhaps the best instance of his picturesqueness is the account of Rupmati’s death, and his most sensible remark is that in the third volume where he says that the accounts of a battle are like the blind men’s descriptions of an elephant. On the other hand, Abu-l-Fazl’s love for sources——the Quellen of the Germans-is far in advance of his age. 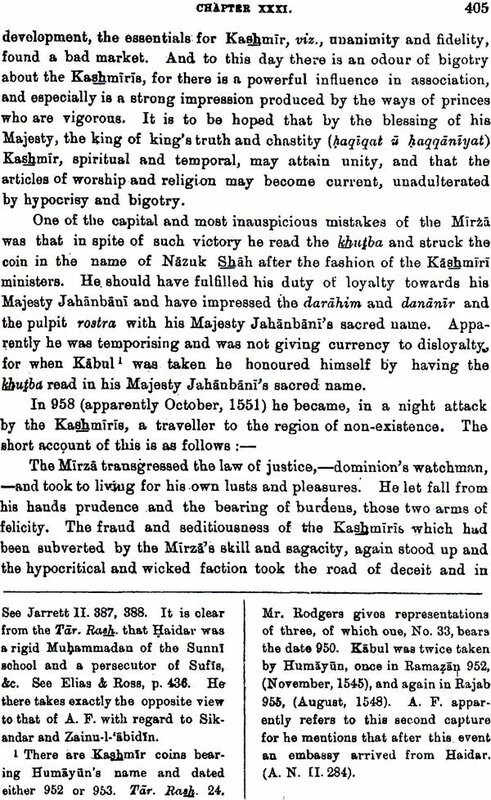 To him we owe not only the Akbarnama but also the Memoirs of Gulbadn Begam, Jauhar the ewer-bearer, Bajazat (Bayazid) Biyat and, perhaps, Nizamuddin’s history. 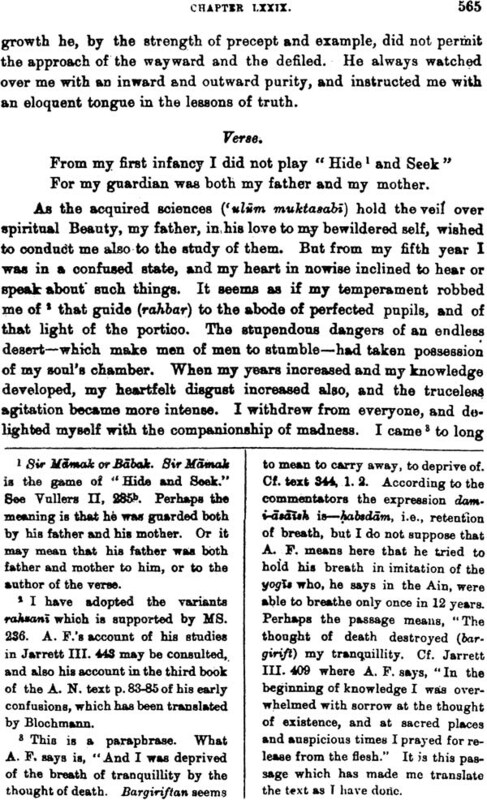 But I have treated of this matter in a paper published in the J.P.A.S.B., Vol. XIV, 1918, Ii. 469. 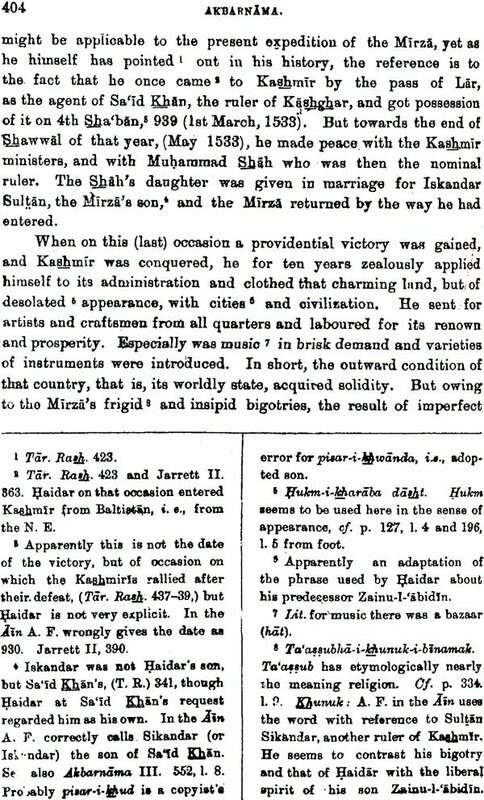 I should also like to say something about Abu—l—Fazl’s flattery of Akbar. It is gross, but it is not unnatural, and is in part the result of an honest hero—worship. We must remember the position of the two men. 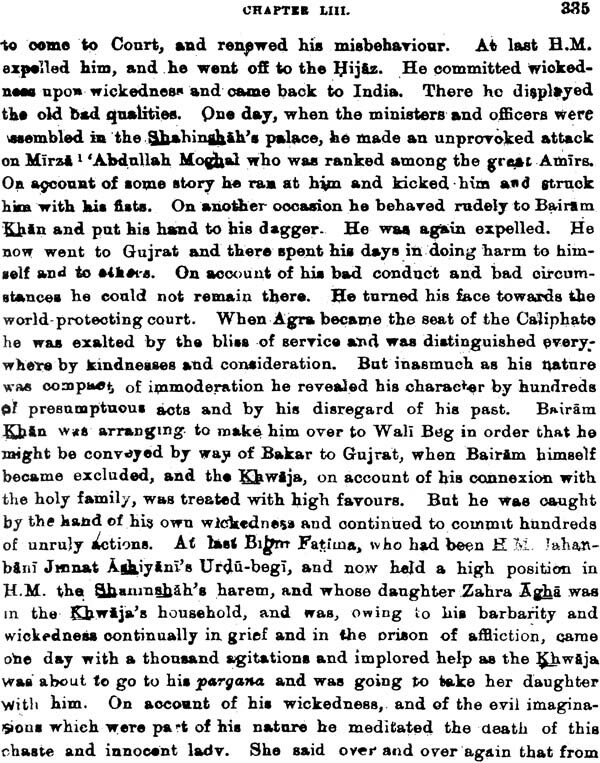 Akbar was emperor of India and a very remarkable man. He had raised Abu-l-Fazl and his family from indigence and obscurity to affluence and power. 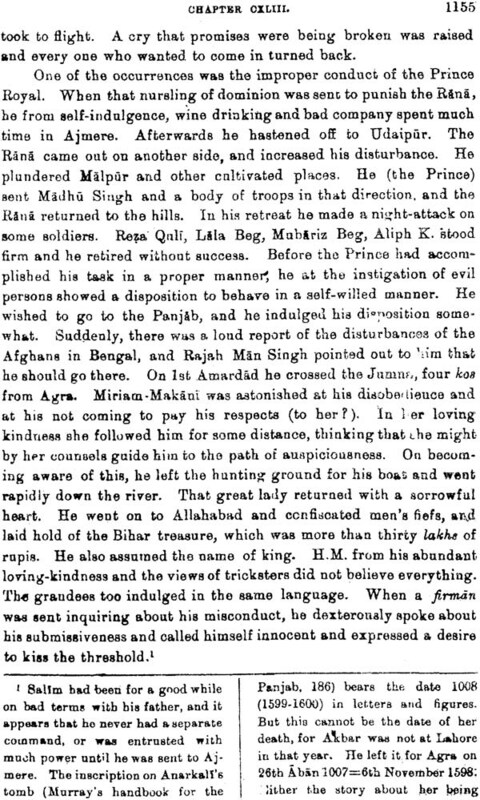 It must also be borne in mind that Akbar was the elder of the two men. 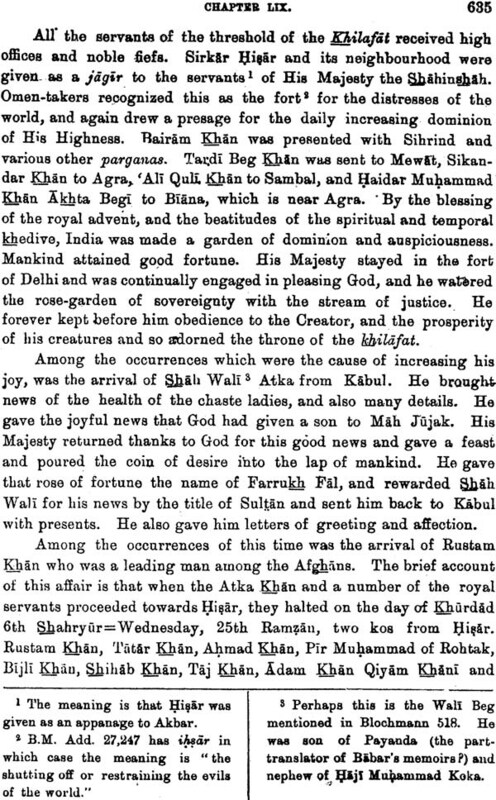 He was born in October, 1542, and Abu•1—Fazl in January, 1550, so that there were seven years and more between them. Akbar therefore was in the position of an elder brother. 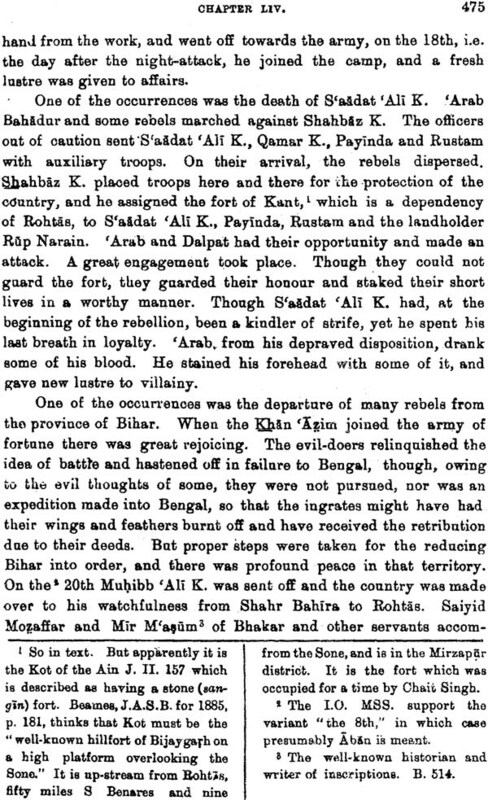 This, when added to the attraction of Akbar’s position as sovereign, was more than human nature could withstand. 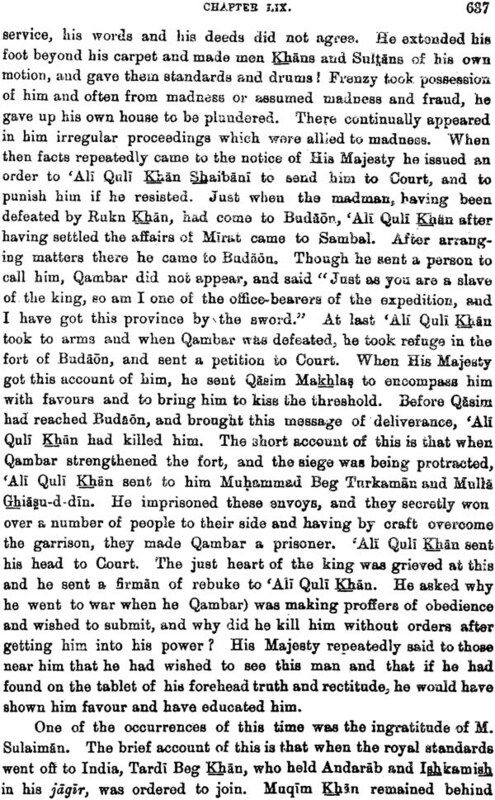 Even Badauni felt this I believe too that Abu—l-Fazl really thought that the fact of Akbar’s ignorance of reading and writing, when combined with his mental gifts him in the category of inspired beings or super-men and placed him on a level with such prodigies as Buddha, Zoroaster and Muhammad, if indeed he was not superior to them. That Abu—l- Fazl really believed in Muhammad’s spiritual greatness, seems to Be proved by his occasional involuntary ejaculations, and by the labour and cost which he bestowed on making copies of the Quran and in publishing an elaborate commentary on it. It is also well- known that all crientals used to believe, and probably do so still, in mystics and fanatics. See also Akbar’s own saying, Jarrett, III, 385: “The prophets were all illiterate. Believers should therefore retain one of their sons in that condition.” He did not, however, keep one of their sons in that condition.” He did not, however, keep any of his three sons uneducated.